The combination of organic material (cured fiberglass resin-a hydrocarbon compound) and metal chips provides a matrix which has the capacity to attract and capture orgone energy as Wilhelm Reich's research demonstrated in the 1930's/40's and discussed in Reich's book, The Cancer Biopathy. Adding a crystal intensifies that process and allows you the opportunity to 'program' the crystal with your mind (and intentions) to direct that energy towards a specific task or goal. 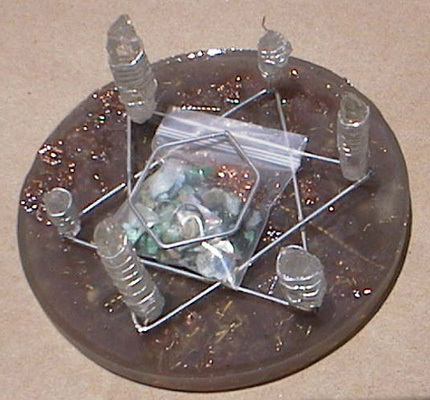 A developer of Radionic devices found that combining fiberglass resin with metal particles produced the orgone attractive-repulsive effect described by Wilhelm Reich and he dubbed this mixture "orgonite". I prefer to use the term "metal/resin matrix" to define the material more concisely. Carol Croft noticed that the human aura expanded when in close proximity to the metal/resin matrix and this led to the idea of adding this matrix to a Hulda Clark type zapper circuit which was termed the Terminator. I found that replacing the copper penny electrodes in the original Terminator with pure silver discs would produce much less irritation and reddening of the skin. I call my spin-off variation The Mini Silver Terminator. The combination of a metal/resin matrix and crystals can tansmute 'DOR', the negative polarity of orgone energy, into 'OR', the positive polarity of orgone energy. It was also noticed that placing an orgone generator in the vicinity of a nuclear power plant had the effect of reducing the size of the DOR orgone field that surrounds all nuclear reactors. An orgone generator can also neutralize the DOR fields which surround ELF and Microwave cell phone towers, alien Reptilian portals, satanic ritual sites, masonic temples, and nuclear reactors. Larger orgone generators (first dubbed an "HHg") were initailly used to neutralize microwave cell phone towers, but it was later discoverd that smaller orogne generators, Tower Busters (TB), will still neutralize the DOR orgone field of a typical microwave cell phone tower if deposited (buried is best) within 1300 feet of the tower. You can make your own Chembuster, Tower Buster, or larger orgone generators from scratch if desired . Chembusters (CB's) are used to break up chemtrails and can dramatically improve the growth of plants within its immediate area. A Powerwand is a type of enhanced pulsed crystal Succor Punch which can be used for both defensive and offensive purposes (but only against those of evil intent). As is the case with all of the orgone gnerators shown here, you can choose to make your own Powerwand, or you can obtain them ready made (see below). Many people notice positive emotional effects in the presence of orgone generators. Mood and emotions tend to elevate. Some people who have trouble falling asleep report that they can sleep better and more soundly with an orgone generator in the bedroom. Many people have noticed that plants grow more vigorously in the vicinity of an orgone generator. I saw a Kirlian (aura photo) photograph of a 30 oz, five crystal dome shaped orgone generator that revealed a large dome of blue aura energy surrounding the generator. It's definitely emiting some form of energy that seems to be positive in nature. This energy may be identical to Reich's description of orgone energy or it may be some other form of energy that interacts with orgone. It's fascinating to observe its effects on people unaware of its capabilities. Some people bring them to work and notice that the office environment becomes friendlier and less competitive. One guy, who took it to court, was winning his case and swaying the jury until the judge ordered him to remove the HHg (which he foolishly set out in plain view on the Defendant's table) from the courtroom. I ofer these orgone generators in either a natural finish or a weathered copper patina finish (with felt-covered base) for a more muted display piece. I originally categorized these TB's according to the size of the paper cup I had used for the mold, but now I classify them according to their actual weight in ounces. Contact me by E mail if you wish to obtain any of these orgone generators as premium gifts: Editor (when inquiring, always tell me the country you live in if outside the USA or your ZIP code if you live inside the USA, so I can give you an accurate shipping quote). 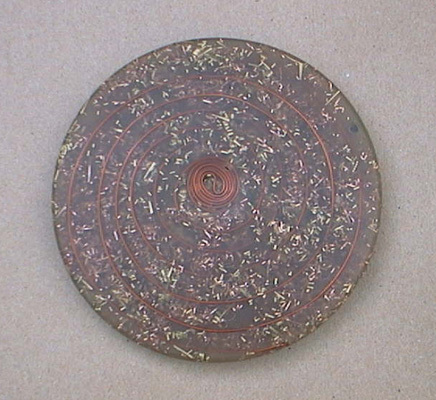 All styles of larger orgone generators (often called HHgs) described here contain five substantial crystals: one large crystal is centered at the tip of a Royal Cubit spiral coil located in the center of the HHg and orientated in the vertical plane. The remaining four quartz crystals are located closer to the bottom of the HHg and are laid out in the horizonatal plane forming a "+" design. The bottom of the HHg is covered with felt. I include two Royal cubit coils with every HHg: the inner cone shaped 3X Royal Cubit spiral coil is placed near the top of the HHg and a flat, pancake shaped 3X Royal Cubit coil wound in the SBB coil configuration is placed at the very bottom. I also add a vial of Raymond Grace blessed water with a list of healing words including "love, health, forgiveness, gratitude, etc." taped to the vial in order to potentize the water further as demonstrated by Masaru Emoto in his frozen water crystal micro-photographs. Style A & Style B orgone generators direct the orgone energy both laterally and radially into a generally diffused dome shape while Style C Single Cast Pyramid and Style D Double Cast Pyramid focus the orgone into a much tighter vortex shape (funnel shaped) at the apex of the pyramid. For general area coverage, Styles A or B will diffuse the energy broadly, while the greater focused energy from Pyramid Style C or D can be more advantageous for healing or radionics work or any situation where a concentrated orgone vortex is desired (such as placing the pyramid under the bed of an ailing individual). The Pyramid HHgs are larger and heavier than Styles A or B and offer some additional atrributes by virtue of the pyramid shape itself. 2. Style B: 31 oz. Copper Patina Finish only, $110; Quantiy discount: 3 or more, $105 each (+ shipping). I include the silver Star of David with the polished Style D Double Cast Pyramid as standard. The bigger 55 oz.Style C Single Cast Pyramid contains 33% more resin, metal, and larger crystals than dome Style A or B. The even larger 65 oz Style D Double Cast Pyramid is sanded with 8 grades of increasingly fine-grit sandpatper and hand polished to a high gloss. A Star of David hexagram made of pure 14 gauge silver wire and cut exactly to the length of 1/2 Royal Cubit is set in the bottom of the Double Cast Pyramid, just above the SBB coil. 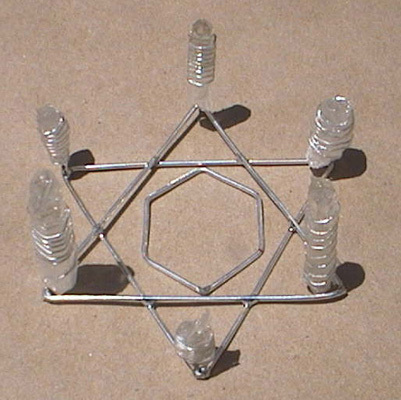 A clear, AA grade double terminated quartz crystal is set at each of the six points of the silver Star of David (crystals not shown in linked photo). Style D Double Cast Pyramid, Sanded and Polished 65 oz. To make the 55oz. Pyramid look more artistic and dramatic, I added a second layer of resin by casting the same Pyramid twice using the same mold. This results in a thicker outer resin covering which I then sand down with eight different grits of sandpaper and polish to a high gloss. I also add the Silver Star of David used in the Mega Powerwands (see below) to the bottom of these pyramids. It takes e a bit of labor and time, but the final results look beautiful. The quotes given below do not include shipping or insurance. If you wish to order, please send me an e-mail and tell me where you live so I can calculate the correct postage and give you a total figure. Style A: 30 oz. Patina Finish, $110 Quantity discount: 3 or more, $105 each (+ shipping). .
2. Style B: 31 oz. Patina Finish only, $110; Quantiy discount: 3 or more, $105 each (+ shipping). 3. Style C: 55 oz. Natural finish Single Cast Pyramid with coils $155, Quantity discount: 3 or more, $150 each (+ shipping). 4. Style D:: 65 oz. Natural finish Double Cast Pyramid, sanded and polished with Silver Star of David embedded in base $245 each (+ shipping). While many people are fascinated by the natural look of orgone generators, other people might prefer a more finished, art-like appearance with less need to answers questions like: "What's it's for?" The Weathered Copper Patina finish gives these orgone generators the look of an esoteric art object either dug up from a ancient Minoan archeological site or something Mr. Spock brought aboard The Enterprise. Either way, it looks nice sitting on a shelf, on top of the TV, or on a desk- without raising suspicions about its true function. The patina finish requires a two step process. I affix the felt base using a strong rubber-like glue. 1. For TB's in the 4oz -11oz range, add $5 each. 2. For 22 oz. Double Crystal TB, add $7 each. The Chembuster (CB) is a spin-off of a device originated by Wilhelm Reich called the Cloudbuster. Reich found that pipes can act as wave guides for orgone energy (a term he coined in the 1930s). Reich discovered that he could channel orgone energy into the pipes if there was a source of water channelled into the oposite end of the pipes. He usually connected empty BX cables to a plenum located at the base end of the pipes and from there ran the BX cables into a running stream of water, or a lake, or into the ocean. Water acts as an attractor to orgone energy. Chembusters behave differently in that they attract the negative polarity of orogne energy (called DOR) into base of the CB and then transmutes the DORpolarity into the positive polarity of orgone (dubbed "OR" or sometimes called "POR" for Positive ORgone). Since early 2004, we've noticed that a Chembuster will encourage the presence of Sylphs, air elementals which have the ability to transmute the toxins embedded within chemtrails into non-toxic substances. It usually takes a couple of weeks for a new CB to acclimate to the local environment, so you may not see dramatic results with chemtrails right away, but hang in there for two or three weeks and you will begin to notice things. The more heavily laid the chemtrails in your area, the longer it takes for the CB to gear up to the task of dispering them. The larger the CB resin/metal chip matrix base diameter, the larger the diameter of the pipes used, the longer the length of pipes used, the more and larger crystals used, the more coils used, etc. means a more powerful punch of orgone transmutation delivered by the CB. I offer both a 2 gallon and a 5 gallon version of the Chembuster. Most people order the 2 gallon Chembuster which uses six, 1 inch diameter copper (or iron) pipes. The six upper pipe extensions are five feet long and plug into a one inch copper pipe coupler connected to the short pipes embedded within the resin/metal chip matrix base. The upper extension pipe assembly is held in place and parallel using a wooden alignment template. The six pipes are evenly spaced out in the bucket in a perfect circle which, when viewed overhead, will give you two sets of 3 pipe triangles that intersect each other as in the Star of David configuration. Setting crystals (inside the pipes) in the Star of David configuration can have some very powerful effects both on the etheric and physical planes. I now 'tune' the lengths of lower and upper copper pipe extensions to match a harmonic of the Phi Ratio (also called The Golden Section = 1.61803) which will takes advantage of the phenomenom of resonance to universal energy frequency relationships and makes the CB function more effectively. .
For crystals, I use the longest and widest Double Terminated (AA grade) Arkansas quartz crystals that I can fit inside the pipe. I always include a 5X Royal Cubit 14 gauge coil at the bottom of every 2 gallon Chembuster and a 6X Royal Cubit coil at the bottom of the 5 gallon Chembuster. If you wish to add the option of more coils or more cyrystals, you can make your selection from the CB Options list below. In 2002, I could buy a gallon of fiberglass resin at Home Depot for $17 + tax. A ten foot length of 1" copper pipe of medium wall thickness (called "M" grade) would cost $13 + tax. Today at Home Depot, a gallon of Bondo fiberglass resin is $36 + tax and a ten foot length of heavier one inch "L" grade (they no longer offer "M" grade) copper pipe is $40.28 + tax .That's roughly a two and three fold increase in cost, respectively. Of course, I will continue to offer ready-made chembusters (CB) and chembuster kits made with "L" grade copper pipe if you prefer the traditional look, however, for those who are not concerned about the aesthetics of using copper pipe, I will now also offer chembusters in either the 2 gallon or 5 gallon size that uses a less expensive, zinc-coated iron pipe. As with the copper pipe chembusters, I install 1" zinc-coasted iron pipe for the 2 gallon CB and !.25" iron pipe for the 5 gallon CB. For those who order the CB base units alone and want to get the upper pipes themselves, it will cost you approximately four times less for six, 5 foot lengths of 1" zinc-coated iron pipes, than the equivalent lengths of "L" grade copper pipe. Zinc-costed iron pipe can replace the copper pipe in the chembuster and still serve the same purpose as a rigid pipe waveguide. Its wall thickness is just as heavy as "L" grade copper pipe, yet it costs nearly four times less than copper pipe. At the time that Don Croft originated the chembuster, copper pipe was relatively cheap, but today the situation has changed and now copper pipe is three times more expensive than it was just four years ago. If economy is uppermost in your mind, consider the zinc-coated iron pipe chembuster in lieu of the copper pipe chembusters. They will work just as well. The two gallon CB is made in a two gallon plastic bucket and uses six, 1 inch copper pipe extensions. You can leave the CB in the plastic bucket for easy portablility or remove it and bury the CB directly into the ground. Plants will always grow more vigorously in the presence of a CB and burying a unit directly into the ground will improve plant growth even more dramatically. Some people put them in the center of their garden and are amazed to see the improvement in plant vigor. Many people have reported that spraying a mist of water on the CB on a daily basis will tend to bring rain (if your area needs it). It's not a guaranteed thing, but many have reported this phenomena. The base unit deal includes six 1 inch copper couplers and a painted wooden alignment template that goes near the top of the extension pipes. You can either pick up your own one inch copper pipes at a local building supply center such as Home Depot or Lowe's, or you can order the whole enchilada from me (see 1B. below). If you get your own pipes, ask the saleman to cut a ten foot length of pipe in half to give you two 5 foot lengths (you want a total of six, 5 foot pipes). This is the 'whole enchilada' if you wish to order the complete chembuster assembly from me. The copper pipe base unit and upper copper pipe extensions come to $515 + insured shipping. There are two boxes to be shipped: one box with the CB base unit (30 pounds) and a second box with the six, 1" copper pipes (23 pounds). You need to tell me where you live so I can give you an exact insured shipping quote on each box to your destination. 1C. Six, 1 inch "L" grade copper pipes alone (cut to exact Golden Ratio harmonic length) as a separate package bundled with six 1 inch copper couplers and one painted wooden template for alignment-$310 + shipping of two boxes (23 pound and 3 pound boxes). This package is offered for those who want a second set of pipe extensions to go on top of the first set, leaving you with a total of approximately 10 feet of pipe extending above the CB (longer pipes allow for greater Chembuster effect). All internal parts the same as the two gallon copper pipe CB base unit, with the exception of the pipe itself which is made of 1" zinc-coated iron pipe and uses 1" iron pipe couplers (it's not a good idea to mix copper and iron pipes together (use one or the other exclusively). Instructions are provided with the CB base unit to tell you where to get the 1" zinc-coated iron pipe. 2B. Two Gallon Iron pipe Chembuster Base and six, 1 inch diameter upper extension iron pipes (cut to exact Golden Ratio harmonic length) - $367 + insured shipping (for two boxes) This is the 'whole enchilada' if you wish to order the complete iron pipe chembuster assembly from me. You need to tell me where you live so I can give you an exact insured shipping quote on each box to your destination. 2C. Six, 1 inch zinc-coated iron pipes alone (cut to exact Golden Ratio harmonic length) as a separate package bundled with six 1 inch iron couplers and one painted upper wooden template for alignment-$165 + shipping of two boxes (23 pound and 3 pound boxes). The five gallon CB base unit offers 2½ times the amount of resin/metal chip matrix along with larger 1¼ inch copper pipes and larger crystals. The bare bones 5 gallon base unit deal includes six 1¼ inch copper pipes imbedded in the base unit, six 1¼ inch copper couplers, the wooden template, six coil wrapped Quartz Crystals, and the 6X Royal Cubit flat coil. 3B. Five Gallon Copper pipe Chembuster Base and six, 1¼ inch diameter upper extension copper pipes (cut to exact Golden Ratio harmonic length-slighlty less than 5 feet long), along with six 1.25 " copper couplers and painted upper wooden alignment template. $790 plus insured shipping of two boxes (69 pounds and 27 pounds). The "whole enchilada" in the 5 gallon copper pipe version. 3C. Six, 1¼ inch diameter copper pipes alone (cut to Golden Ratio Harmonic length) as a separate package bundled with six 1¼ inch copper couplers and one painted wooden alignment template -$363 plus shipping of two boxes (27 pounds and 3 pounds) (Add $32 for a seventh pipe if desired) You need to tell me where you live so I can give you an exact insured shipping quote on each box to your destination. The five gallon CB base unit offers 2½ times the amount of resin/metal chip matrix along with larger 1¼ inch iron pipes and larger crystals. The bare bones 5 gallon base unit deal includes six 1¼ inch zinc-coated iron pipes imbedded in the base unit, six 1¼ inch iron couplers, the upper wooden alignment template, six coil wrapped Quartz Crystals, and the 6X Royal Cubit flat coil. 4B. Five Gallon Iron pipe Chembuster Base and six, 1¼ inch diameter upper extension iron pipes (cut to exact Golden Ratio harmonic length-slighlty less than 5 feet long), along with six 1.25 " iron couplers and painted upper wooden alignment template. $625 plus insured shipping of two boxes (69 pounds and 27 pounds). The "whole enchilada" in the 5 gallon iron pipe version. 4C. Six, 1¼ inch diameter zinc-coated iron pipes alone (cut to Golden Ratio Harmonic length) as a separate package bundled with six 1¼ inch iron couplers and one painted wooden alignment template -$206 plus shipping of two boxes (27 pounds and 3 pounds) (Add $10 for a seventh pipe if desired) You need to tell me where you live so I can give you an exact insured shipping quote on each box to your destination. A Powerwand (PW) is an enlarged version of a Succor Punch embedded in a resin/metal matrix. Don Croft's original version of the Powerwand used a crystal that was 6-8 inches long and about 1 inch in diameter. He embedded the mobius-wrapped crystal within the resin/metal matrix using a 3" copper pipe that was 9" long with copper end caps installed at both ends. The copper pipe made a strong casing for the PW, but it also made it a little bit too heavy if you wanted to carry it around with you. The copper pipe isin't absolutely necessary for the PW to function, as you can substitute copper shavings in the matrix and get the same energy signature. I like to use both copper and silver in my Powerwands because alchemically, they are a perfect match, contributing complimentary male and female energy. To reduce weight, I prefer to make the normal sized Powerwand in a 3 inch cylindrical shape without the copper pipe and add the cooper to the resin as shavings and coils. . I always install a 2.1mm jack on the upper facet of the crystal so I can plug a gold plated 2.1mm plug audio cable into the SP Pulser and pulse the Powerwand externally using a cable, rather than having the SP Pulser enclosed within the lower copper cap and hard wired to the crystal. I wanted to avoid the weight involved with the 3 copper pipe and end caps. I also felt that maitenance and access to the SP Pulser (changing the internal 9V battery or plugging in the DC wall adapter) is far more convenient when the SP Pulser is not enclosed in the bottom of a pipe, so I prefer to set the SP Pulser on the table next to the SP crystal using the shorter 7" connecting cable or place it out of sight altogether using the longer 4 foot connecting cable. Powerwands start at $250 and go up in $100 increments ($350, $450, and $550), up to the largest version, the Mega Powerwand for $650 plus shipping. The Mega Powerwand is described in greater detail below. The length and diameter of the crystal, the clarity of the crystal, the amount of sacred geometry involved, the number of mobius knot nodes, the overall length of the mobius coil used, and the size of the orgonite cylinder all factors involved in the Powerwand size chosen. I also add a vial of structured water, blessed water, and Agnahotra clay to every Powerwand. Beyond applications for psychic and psychotronic protection, a Powerwand can be programmed with your intention to address any problem or concern. I programmed the Powerwand seen below with my focused intent (along with many other people) to deactivate and weaken Hurricane Wilma on October 23, 2005 when it was building up strength in the Carribean, on its way to Florida. If you recall, Wilma fizzled beautifully and was a non-event, despite the best efforts of the HAARP, the military boys with GWEN, and the ELF tower operators. I made a much larger version of the conventional Powerwand using a 2.5 quart container for a lady who needed special help. I used a much bigger seven pound quartz crystal, more coils, sacred geometry and a greater variety of gemstones for this woman who was being tormented beyond words. She was on the receiving end of very advanced psychic and psychotronic torture technologies that was slowing killing her and she had no way to fight back. About a month later, I was contacted by another person who also wanted the biggest Powerwand I could make and after telling him about the big one I made for the lady, he said he wanted the same thing, so I decided to call this enhanced version, the Mega Powerwand. Crystals used for the Mega Powerwand are in the 5-8 pound range. They have a distinct and sharp faceted tip that projects above the resin/metal matrix. For these larger diameter crystals, I use two or three mobius coils that are wired together in series. The two coils (11 turns each) of Silver Wrap can in installed over or under the mobius coils. It's important to wrap one silver coil in a clockwise direction and the second one in a countercolckwise direction. The spacing between the silver coil turns are not critical, but I try to spread the silver coils out over the clearest portion of the crystal if feasible. All Mega Powerwands come with a 4X Royal Cubit SSB coil installed on the bottom. The Sacred Geometry includes a Star of David design (based on 523mm 'Lost Cubit' from Hans Becker) made of silver wire and individual double terminated quartz crystals located at each corner of the Star, wrapped with nodal coils, and centered with silver wire hexagons. A plastic bag of gemstones is sandwiched between the two silver hexagons. 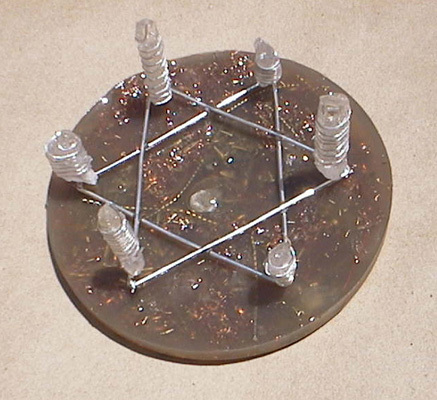 A resin/metal matrix is then added to the top of the Star of David nodal crystals and allowed to cure. After the resin cures, the big crystal with its mobius coil and Silver Wrap coils is installed with a 5X Royal Cubit 18 gauge copper coil (wound clockwise) surrounding the crystal from its base to just below the top surface of the resin. Metal shavings mixed with the polyester resin for the Mega Powerwand include aluminum, brass, copper, and 99.99% pure silver. Thanks to a suggestion from Gale Stark, I add activated carbon granules to the resin while still in the liquid state. Since humans are carbon based, the frequency signature of carbon is enhanced and amplified with positive OR orgone energy produced by the Mega Powerwand. Page under construction. To be continued..